A group of seekers from Mumbai, who had been on a quest for a true enlightened master, finally found Bapuji in the remote village of Sayla by a magnanimous stroke of divine luck. Despite his adamant resistance to accept them as his disciples, they persisted and finally he had to relent. Thus the Ashram was established on the 31st of December 1976 and it bore the names of the two spiritual soulmates ‘Raj’ and‘Saubhag’ who had benevolently created this lineage. Soon spiritual aspirants from far and wide flowed in drawn towards Bapuji’s loving grace like honeybees to nectar. Upholding the fundamental principles of Jainism, the teachings of the great Jain sages of the past centuries, the essence of Shrimad Rajchandra’s precepts and the very words of his own spiritual masters, Bapuji set alight a divine flame of spirituality. Patiently and gracefully Bapuji worked with each disciple to unlock the divinity that lay dormant within every one of them. A few disciples stood out with their unrelenting love for the master and their fervent thirst to experience the truth. Foremost among them were Shree Sadgunaben C. U. Shah and Shree Nalinbhai Kothari. Sadgunaben’s determind and dedicated pursuance could open up the gates of grace and Bapuji worked hard and took utmost care for her spiritual development. Her silence spoke louder then words, andher tranquil serenity flowed unabatedly. In the year 1993, at the age of 88, Bapuji handed over the spiritual leadership of the Ashram to Param Pujya Nalibhai Kothari, who fondly came to be known as Bhaishree and Param Pujya Sadgunaben Shah, reverently addressed as Gurumaa. The tradition of ‘Guru and Disciple’ has been kept alive in Sayla under the tutelage of Pujya Ladakchand Manekchand Vora, sixth in line of Gurus from Shri Saubhagbhai, through the ‘Raj Saubhag Satsang Mandal’. Pujya Ladakchandbhai, affectionately called Bapuji by the ‘extended family’ of all the mumukshus, wanted to highlight Pujya Saubhagbhai’s importance, both spiritually and in the continuity of the tradition. 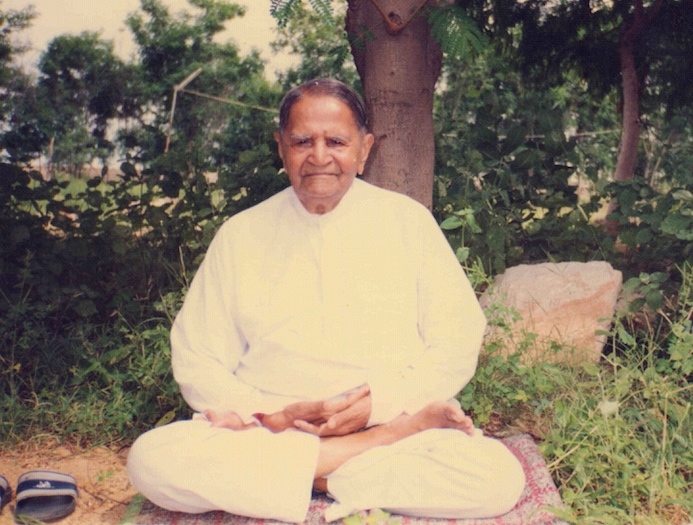 The name of the Yog Ashram he established, ‘Raj Saubhag Ashram’, honours this significance. Bapuji elucidated the teachings of Jain religion through Shrimad Rajchandra’s spiritual achievements and inspired devotional love for Shrimad in the hearts of the mandal’s family. On the 8th of March 1905, Shree Manekchandbhai and Shrimati Hariba became the proud parents of a baby boy in the town of Chorvira in Sayla Taluka. They were so fond of the baby that they named him Ladakchand, and true to this name, he was very endearing. His mother Haribai’s virtues of kindness, compassion and generosity were widely known and were instilled in Bapuji from early childhood. These virtues of integrity, morality and honesty were accompanied by a talented and discerning mind that was evident from his early schooling. Completing his schooling in Chorvira up to the fourth year with brilliant academic performance, he then went to Rajkot for further education where he maintained his high performance and completed matriculation with an ‘A’ grade. With enthusiasm akin to students all over the world, he also engaged in extra-curricular activities in fields other than his formal studies, being a Prefect, a Monitor and the Secretary of the Debating Society. 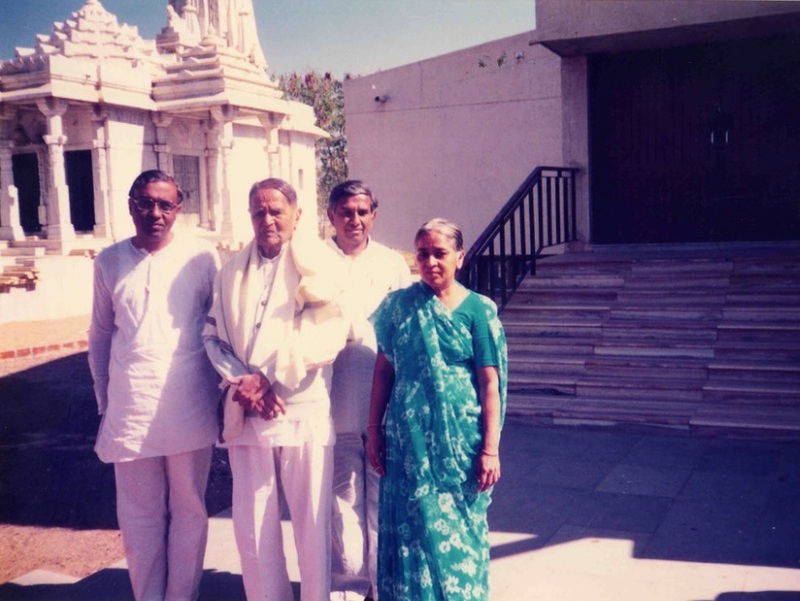 In the wider academic arena, he achieved top marks from the whole of India in the Jain examination on Mokshmala, a composition by Shrimad Rajchandra. This achievement was followed by excelling in another examination relating to the book ‘Aatmaane Aulakho’ (Know the Soul). These two successes resulted in his being honoured and presented with an award at the Jubilee Town Hall of Rajkot. These successes were accompanied by a first class achievement in an essay competition on Health and Hygiene and, in addition, he also passed the Intermediate and final examinations in Drawing. Right from his school days, Bapuji had paid great attention to spiritual growth and its implementation in his life. Bapuji recollected that he had begun the practice of introspection of his life soon after studying and passing the examination of ‘Mokshmala’, and began harnessing his energies towards the cultivation of virtues from the age of seventeen. He implemented the practice of ‘Pratikraman’ informally by examining his daily activities in the evening to check whether he had engaged in any falsity, even though from childhood he had never formed the habit of lying. Diligently he inspected his activities to check for any shortcomings arising from anger, egoism, deceit and greed, and should there be any such faults, he resolved to be vigilant not to repeat them in the future. He also developed the habit of progressively increasing the implementation of good deeds. Bapuji had a great many noble habits from his very childhood: practicing what he believed to be the truth regardless of society’s judgement; not to impose himself; not to flaunt his intelligence; to greet everybody with equal warmth; not to lose control of his senses; to be firm of mind; never to lie for any gains; never to forgo goal of inner development. All these virtues had already been manifested in his childhood but flourished during his time in Rajkot. After completing his matriculation, he took up employment in the local council of Sayla. His progress greatly in his career, from a mere attendant to the high post of a judge! After the Independence of India he took up various posts in Saurashtra’s local government: Three years as a Mahalkari at Jamkandornna; two years as a Government Revenue Officer at Botad; three years at Mahuva; three years at Bhavnagar; and one year at Bhavnagar as a Deputy Collector, equivalent to Deputy Governor. Thoughout his period of public service in high positions of influence he never wavered in his integrity and honesty. He was completely impartial in carrying out his duties and was honest to the extent that he would not bring home even a pencil from work unauthorised! After serving in these various capacities for twelve years he retired on the 8th of March 1960. During his career, all his time was not spent only in governmental duties, because his primary personal goal was spiritual development. At this time there were many spiritual seekers around in the area, including some self-realised persons, and Bapuji was in contact with them from the age of twenty three. For nearly ten years, besides deep studies of the spiritual works of saints such as Anandghanji, Chidanandji, Yashovijayji, Kabir, Chhotam, Pritam, he also engaged in intense study of Shrimad Rajchandra’s ‘Vachnamrut’. After an objective and impartial study of the philosophies of all these saints he concluded that Shrimad Rajchandra’s writings closely paralleled the teachings of the Jain Tirthankars and other previous saints. He also studied Adhyatmasaar, Gyansaar, and Adhyaatma Upanishad from the great monk Pujya Maharaj Mannikyasagar by staying with him during the latter’s monsoon retreat in Sayla. Bapuji's spiritual growth was nurtured close contact with great souls and an immersion in the thoughts of noble souls of the past. He cultivated such an intense aspiration for self-realisation that it affected him physically and he became emaciated. Eventually at the age of thirty two, on 14th January 1937, seeing his readiness, Pujya Chhotalal Desai bestowed upon him Beej Gnaan. This happened on the first floor of Chhotabhai Desai’s house in the presence of Pujya Kalidasbhai and Pujya Vrajlal Belani. He attained that which he had so intensely aspired for, and a spiritually obstructing veil was lifted. At the time Pujya Kalidasbhai predicted that because of his young age he would make great progress and this was realised very quickly. Because of the firmness of his foundation, his state of readiness, his prior preparation and his deep understanding, within seven days, Bapuji attained self-realisation and entered into his inner realm. Being very self-contained man, and exhibiting immense humility, Bapuji maintained spiritual anonymity for forty years in the beneficial presence of Pujya Chhotabhai; Bapuji would not take on disciples during the lifetime of his Guru. In anonymity and silence he persevered with his spiritual growth and increasingly progressed further by reading the writings of only saints who were self-realised and experiencing and realising their wisdom in his own spiritual progress. It is due to our great punya that Shree Shantibhai Ambani inadvertently took up the task of bringing Bapuji out of this anonymity. 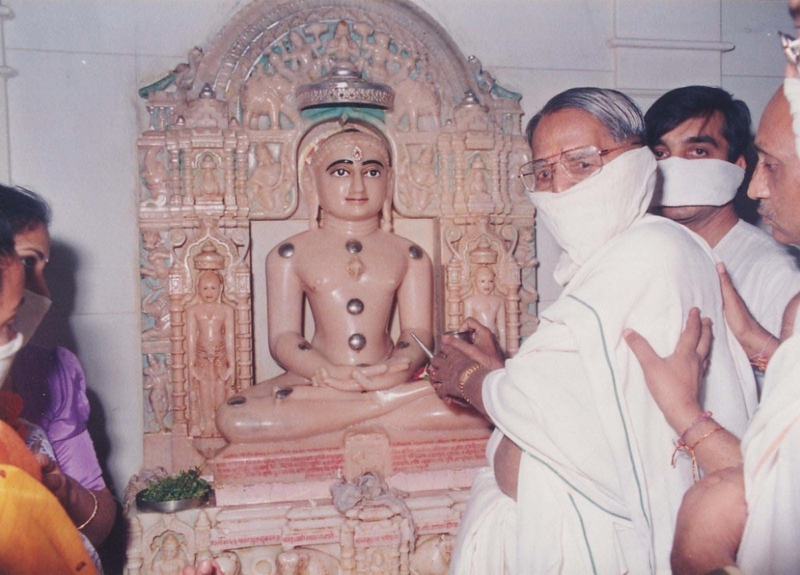 Being of spiritual nature, Shantibhai had studied the Jain religion deeply and had also studied the writings of Shrimad Rajchandra. During a five year in-depth study of Vachnamrut in Devlali he was perplexed by a couple of expressions relating to ‘GuruGam’, meaning the esoteric enlightening wisdom imparted by a living True Guru, and ‘presence of a self-realised person’ and thus he began the search for a self-realised Guru. He went far and wide in this search to places like Vrajreshwari, Ganneshpuri, HariOhm Ashram, Aabu, Ider, Aagaas, Kaavithaa, Vadvaa. Eventually, due to the benevolence of a MahaSatiji (Jain Nun), he came to know about Pujya Chhotabhai and Bapuji. When Shantibhai approached him, Bapuji told him that he would not utter a word on the subject during the lifetime of his Guru Pujya Chhotabhai, who was at the time resident in Calcutta. As Shantibhai was preparing to visit Calcutta, he received the news that Pujya Chhotabhai had just passed away. So he came back to Bapuji and, referring to his words about staying mute on the subject during the lifetime of his Guru, who had now passed away, sought his refuge again. Bapuji relented and agreed to take him under his shelter on the condition that he did not tell anybody else; but this caused further dilemma as Shantibhai had made a pact with Nagindasbhai Kalyanji Shah and Lavchandbhai Ghelani that whoever found a SadGuru (True Guru) should inform the other two. Eventually in his compassion Bapuji agreed to show the path to all three. Then, pouring the truth of the spiritual teachings to the three, he lifted them to a spiritual readiness when he bestowed the BeejGnaan upon them. As the three progressed spiritually, their family members sought Bapuji’s refuge. This spread so that even seekers from overseas came to Bapuji, leading to an increased number of visitors to Sayla. Now that the number of visitors to Sayla had increased so much, an ashram was to be established at Sayla. Bapuji, who had tremendous regard for Saubhagbhai, highlighted his importance by establishing the ‘Raj Saubhag Ashram’ in Sayla on 31st December 1976, initially at the house of Pujya Chhotabhai Desai and later on at the current larger premises on 25th February 1985. Thus the legacy of the two spiritual soul mates, Shrimad Rajchandra and Shri Saubhagbhai, was kept alive by the establishment of the Ashram. Besides continuing to serve his wisdom to the mumukshus at the Ashram, due to his compassion Bapuji made several trips abroad at the many requests of the overseas mumukshus to serve them as well. Thus Bapuji led the seekers along the path of spiritual progress so that eventually nearly a dozen seekers reached the high spiritual state of Brahmanisht. When Bapuji was satisfied that the tradition of Guru and Disciple was well established and there were highly developed individuals who could continue the tradition, he relinquished the high seat of ‘Guru’ to Smt Sadgunnaben C U Shah (Param Pujya Gurumaiyaa) and Shree Nalinbhai Kothari (Param Pujya Bhaishree). This relinquishment was so complete to Bapuji that during any Swadhyay sessions if Bapuji wanted to speak he would first ask for Pujya Bhaishree’s permission! Also, in his wider vision, Bapuji appointed two younger Brahmanishts, Pujya Vikrambhai and Pujya Minalben, to guide the incoming younger generation. Bapuji passed away on 9th December 1997 soon after returning from one of his overseas trips. Thus the tradition of Guru and Disciple was continued by Bapuji, to become the cause of emancipation for us all and the Jain path of salvation has come down to us from Mahavir Swami down through Shrimad Rajchandra, Shree Saubhagbhai and their disciples who had implemented it in their lives and succeeded in their spiritual quest.